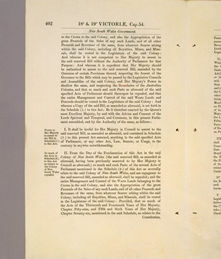 This document is an assent original of the Act of the British Parliament enabling Queen Victoria to assent to the New South Wales Constitution Act, which forms a schedule to this Act. 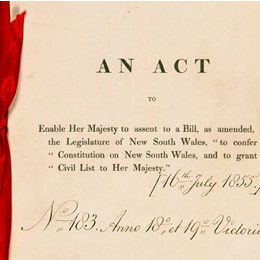 The Scheduled Act is an amended version of the legislation passed by the New South Wales Parliament in 1853. 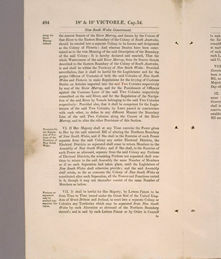 The British Act thus confers a Constitution on the Colony of New South Wales and establishes the first basic and lasting institutions of parliamentary democracy in Australia. 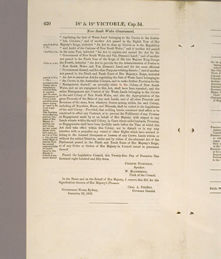 In 1850, the British Parliament passed the Australian Constitutions Act which, among other things, provided for the separation of Victoria from New South Wales, and liberalised the franchise qualifications for the New South Wales Legislative Council. It also empowered the Governor and the Legislative Council, with Britain's approval, to establish a parliament of two houses, either appointed or elected. 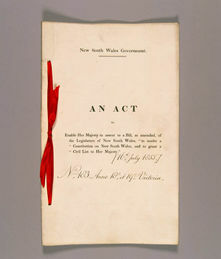 New South Wales colonists criticised the Act for insufficiently providing for local control of revenue, and for failing to give the Legislative Council full powers. The demand for self-government grew and a draft Constitution for New South Wales was prepared by a Legislative Council committee headed by William Wentworth. After amendment in the Council, it was adopted on 9 August 1853 and taken to Britain. 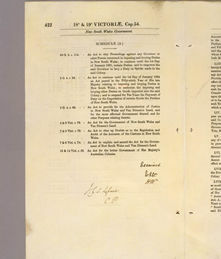 The British authorities thought it went too far in the direction of self-government and they amended it, before it was put, as a Schedule (known as the 'New South Wales Constitution Act') to an Imperial Act. 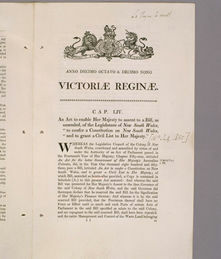 The Act received the Royal Assent on 16 July 1855. The New South Wales Constitution Act 1855 established a bi-cameral parliament with a Legislative Assembly elected on a broad property franchise, and an appointed Legislative Council. It provided for wide powers over domestic matters, including revenue raising and land. Britain still retained the power to disallow colonial legislation. The Act also provided for the New South Wales Governor, acting on the advice of the Executive Council, to make appointments to public office. While 'responsible government' (with Ministers of State drawn from the Parliament) was not expressly included, this was clearly intended. Melbourne, ACV, Early Constitutional Development in Australia, University of Queensland Press, Brisbane, 1963. Waugh, John The Rules: An Introduction to the Australian Constitutions, Melbourne University Press, 1996. The document is printed in black on gatherings of off-white vellum leaves. These are pierced by three holes in the left-hand margin and bound by a red silk tape passed through them and tied on the front cover. Detail from the cover of the New South Wales Constitution Act 1855 (UK).